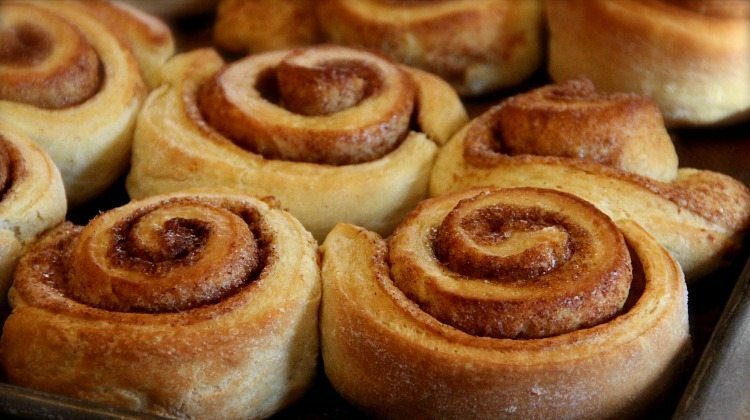 Mrs. Lindsey’s Cinnamon Rolls have reached epic status for anyone who grew up on the Old Mission Peninsula and attended Old Mission Peninsula Elementary School (OMPS). Mrs. Lindsey, along with Jo Brown, Clarissa Boursaw and others, were cooks at the school, and back then, all the food was home-made right there. Including Mrs. Lindsey’s Cinnamon Rolls. Her daughter Helen Mumford gave me the recipe in 1998, and while my rolls might not have the same magical love as Mrs. Lindsey’s, they take me back to a simpler time and hold a lot of nostalgia for me. Do you have a favorite memory of Mrs. Lindsey’s cooking or OMPS food? Leave thoughts in the comments below. After mixing, sprinkle 3 packages of dry yeast over top and let stand 5 min. or until dissolved. Mix 1 c. cornmeal, 1/2 c. dry milk, and 3 c. flour together, then add to liquid and keep adding flour until you can mix by hand. Turn out on board and kneed a little. Place in ball, cover and let rise 1/2 hour to 1 hour. Divide into 3 equal parts. For Bread: Place in pans and let rise until half again the size. For Rolls: Roll out, spread with melted butter, cinnamon and sugar. Roll up, slice and place in pan. (Place melted butter with Karo Syrup in bottom of pan if candy bottom is desired). For bread: Bake 350 for 40 min. For cinnamon rolls: Bake 375 for 25 min. Makes 3 loaves or 3 dozen cinnamon rolls. I remember those…and her cherry pies among other things. Most of all I remember Lucile’s kind loving heart and her openness and warmth. Thanks for the reminder of my wonderful time on Old Mission. Before OMPS opened, I used to spend time with Mrs.Lindsey In The kitchen at the old school that they made in to their house. My older brother, Ralph, would take me to school with him when my Mother needed a babysitter and I would stay downstairs in the kitchen with her. We would make peanut butter and honey sandwiches for lunch and take them upstairs to the class room at lunch time. She was also my 4H leader for sewing. I remember making an apron. What a great story. I loved going to Bible Study at the Lindsey’s, with everyone gathered around their kitchen table.